Currency Crisis! So What Happens If The Dollar And The Euro Both Collapse? Some analysts are warning that the U.S. dollar is in danger of collapse because of the exploding U.S. government debt, the horrific U.S. trade deficit and the new round of quantitative easing recently announced by the Federal Reserve. Other analysts are warning the the euro is in danger of collapse because of the very serious sovereign debt crisis that is affecting nations such as Greece, Portugal, Ireland, Italy, Belgium and Spain. So what happens if the dollar and the euro both collapse? Well, it would certainly throw the current world financial order into a state of chaos, but what would emerge from the ashes? Would the nations of the world go back to using dozens of different national currencies or would we see a truly global currency emerge for the very first time? Up until recently, the idea of a world currency was absolutely unthinkable for most people. In fact, the notion that all of the major nations around the globe would agree to a single currency still seems far-fetched to most analysts. However, if enough “chaos” is produced by a concurrent collapse of the U.S. dollar and the euro, would that be enough to get the major powers around the world to agree to a new financial world order? Let’s hope not, but it is getting hard to deny that we are heading for a major currency crisis, and if the U.S. dollar and/or the euro collapse, the world will certainly never be the same afterwards. In case you missed it, China and Russia made a very big announcement the other day. They told the world that instead of using the U.S. dollar to trade with each other, they will now be using their own national currencies. Most Americans don’t realize it, but that is a very, very big deal. The fact that the U.S. dollar has been the primary reserve currency of the world for decades has given the United States a tremendous amount of economic power. 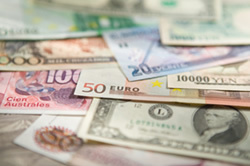 But now nations are beginning to lose confidence in the U.S. dollar and they are slowly starting to move away from it. When the Federal Reserve announced a new round of quantitative easing in early November, it created a huge backlash from other nations. For decades, many other countries have been heavily investing in dollar-denominated assets, and now they are quite upset that those assets are going to be devalued. Chinese Finance Vice Minister Zhu Guangyao used very strong language in denouncing the Fed’s new quantitative easing scheme earlier this month…. German Finance Minister Wolfgang Schäuble was even more blunt. He has called current Federal Reserve policy “clueless”, and he says that he is absolutely disgusted with the Federal Reserve at this point…. If the Federal Reserve keeps flooding the system with new dollars, the rest of the world could eventually totally reject the U.S. dollar and U.S. Treasuries. If that day ever arrives, the results would be beyond catastrophic as the following short video from the National Inflation Association demonstrates…. But it is not just the U.S. dollar that is in trouble. The euro is in danger as well. Just consider the financial problems that some major European nations are experiencing right now…. *Standard & Poor’s has slashed Ireland’s credit rating two notches to “A”, and is warning that there could be further downgrades. The Irish budget deficit is projected to reach 32 percent of national output this year. Ireland’s finances are being called “just one big pyramid scheme”, and they recently accepted a huge European bailout. Unfortunately for Ireland, this bailout comes with strings. The Irish government is now being forced to implement an austerity program that is being referred to as “draconian”. *Analysts are projecting that Portugal is going to need a bailout of at least 50 billion euros. The government of Portugal has implemented some harsh austerity measures in an attempt to get the red ink under control, and the people are not pleased. On Wednesday, a massive national strike shut down travel and basic services across the country. *Things are so bleak in Portugal right now that Foreign Affairs Minister Luis Amado recently stated that his nation “faces a scenario of exit from the euro zone” if a solution is not found for this financial crisis. *Greece was the first nation to need a European bailout, and now there are rumors that they may need even more assistance. The statistics agency for the EU, Eurostat, recently revealed that Greece’s budget deficit for 2009 was actually 15.4% of GDP rather than 13.6% of GDP as originally thought. The Greek national debt is now well over 120 percent of GDP. The financial problems in Greece never seem to stop. *Belgium’s debt has reached 100 percent of annual national income, and the cost of insuring that country’s debt has now hit record levels. *Even Spain is in trouble. Rates on Spanish 10-year government bonds have risen to frightening heights in recent days, and the official unemployment rate in Spain is hovering around 20 percent. *In a recent article entitled “A Spanish Bailout Would Test Europe’s Strained Finances“, the New York Times quoted Jordi Galí, the director of the Center for Research in International Economics at Barcelona’s Pompeu Fabra University as saying that rumors that Spain is in financial trouble could end up making it a self-fulfilling prophecy…. So could this sovereign debt crisis actually cause the euro to collapse? European Financial Stability Fund chief Klaus Regling says that there is “zero” chance that the euro will collapse…. Other European leaders are not so sure about that. EU President Herman Van Rompuy recently warned that if some of the weaker countries in Europe are forced to abandon the euro it will likely cause a total meltdown of the European Union…. German Chancellor Angela Merkel is also warning that a failure of the euro could bring down the entire European Union…. But is this likely to happen any time soon? No, probably not, but in 2010 top European officials are actually acknowledging the possibility, and that shows just how serious things have gotten. So if the U.S. dollar and the euro do collapse, what would happen? Well, already many world leaders are openly speaking of the need for a true global currency. After all, they argue, there won’t be any “currency wars” if we are all using the same currency. In fact, the Institute of International Finance, an organization that represents 420 of the biggest banks and financial institutions on the globe, recently declared that the time has come to adopt a one world currency. In fact, as I wrote in an article entitled “Bancor: The Name Of The Global Currency That A Shocking IMF Report Is Proposing“, a recent IMF policy paper actually proposed a name for the “global currency” that they believe could be coming…. A paper entitled “Reserve Accumulation and International Monetary Stability” by the Strategy, Policy and Review Department of the IMF recommends that the world adopt a global currency called the “Bancor” and that a global central bank be established to administer that currency. The report is dated April 13, 2010 and a full copy can be read here. Unfortunately this is not hype and it is not a rumor. This is a very serious proposal in an official document from one of the mega-powerful institutions that is actually running the world economy. Anyone who follows the IMF knows that what the IMF wants, the IMF usually gets. So could a global currency known as the “Bancor” be on the horizon? That is now a legitimate question. So will any of this ever come to fruition? Well, it would likely take one whale of a crisis to get the countries of the world to agree to such a thing. However, we do live at a time when the world financial system seems to be perpetually on the edge of chaos. If at some point the U.S. dollar and the euro totally fall apart perhaps we will see a “new order” arise out of all of that chaos. But let’s hope not. Once we give any organization the power to issue a global currency the odds of us ever getting our economic sovereignty back will be greatly reduced. The internationalists are going to use any crisis as an opportunity to argue for greater centralization of the world financial system, and it will be very important for the American people not to fall for those arguments. Hopefully the U.S. dollar and the euro can remain stable currencies for at least a little while longer. Because once they collapse things will never, ever be the same again. Happy Thanksgiving! Are You Better Off Today Than You Were Four Years Ago?